Current prostate cancer treatments include surgery, radiotherapy, chemotherapy, and hormone therapy. 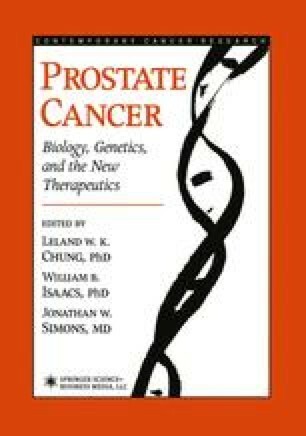 Efforts in early detection of prostate cancer—which include serum prostate specific antigen (PSA) screening and digital rectal examination—have allowed for diagnoses of the disease at its earliest stages. Treatment strategies such as radical prostatectomy and local radiotherapy are largely successful for patients with clinically localized prostate cancer (14,32,64). Brachytherapy is an example of a novel method to introduce radioisotopes to localized cancer tissues (40). This method implants radioactive seeds directly into tumor sites, minimizing exposure to surrounding tissues. A 10-yr follow-up study involving brachytherapy treatment of 152 consecutive patients with clinically organ confined prostate carcinoma reported a disease-free rate of 64% (41). However, up to one-third of patients initially diagnosed with clinically localized disease and treated with conventional treatments may eventually develop metastases (20).